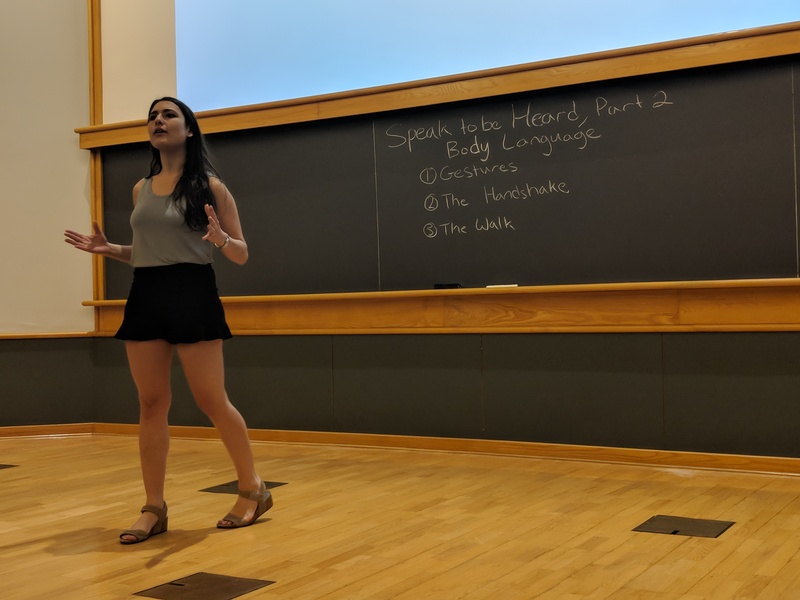 Judy Mizrachi, WiSE member & graduate student in the Osten lab, led a very special two-part “Speak to be Heard” workshop at the end of August. 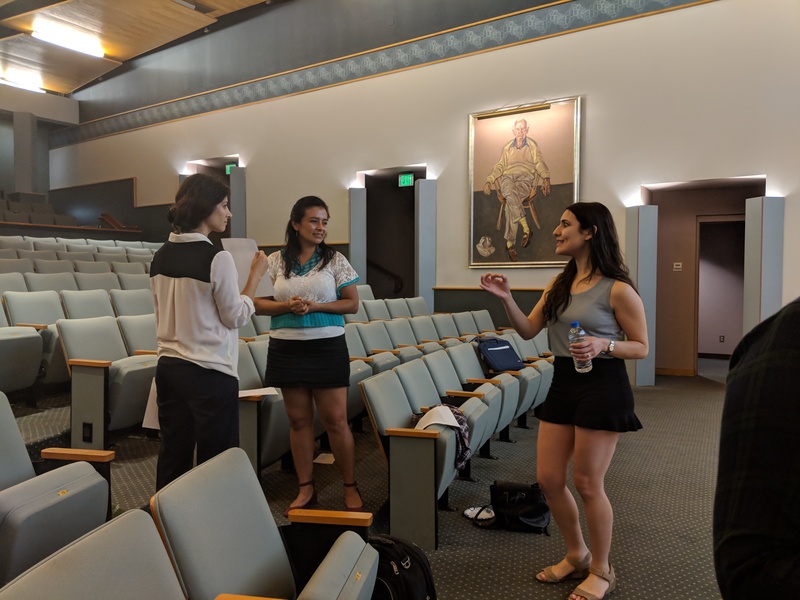 With an Associate of Arts degree in performing arts and theater, Judy Mizrachi came to WISE with a proposal to teach a workshop on vocal techniques and body language that contribute to effective communication. 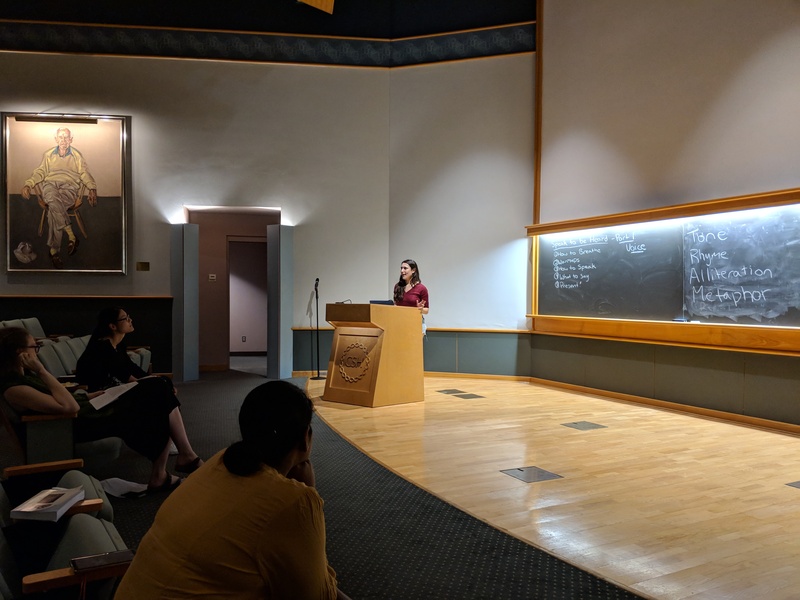 Since presentations, lab meetings, and collaboration are key components of scientific research, we were excited for the unique skill-set Judy was prepared to share with us to help us control a room and be heard by our peers. 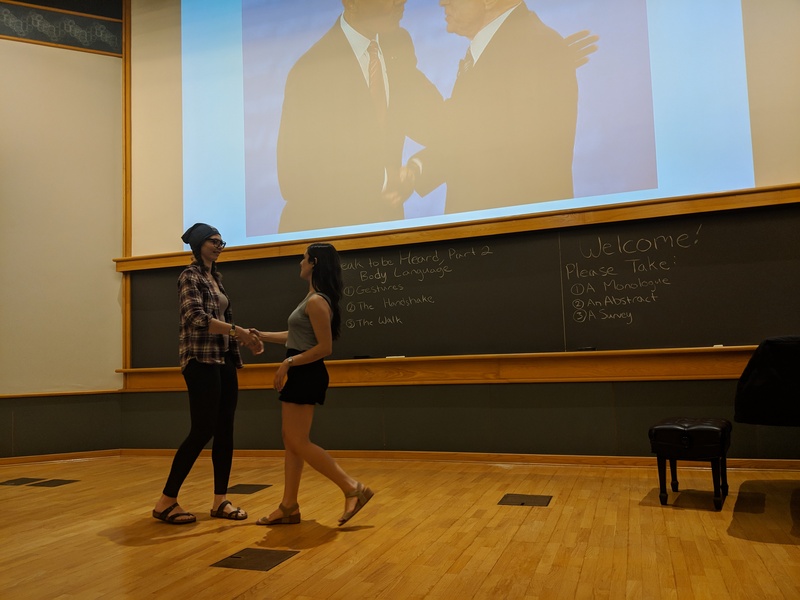 The first night of the workshop was dedicated to voice and began with breathing and vocal exercises like repeating “Sit-on-a-potato-pan-otis”. 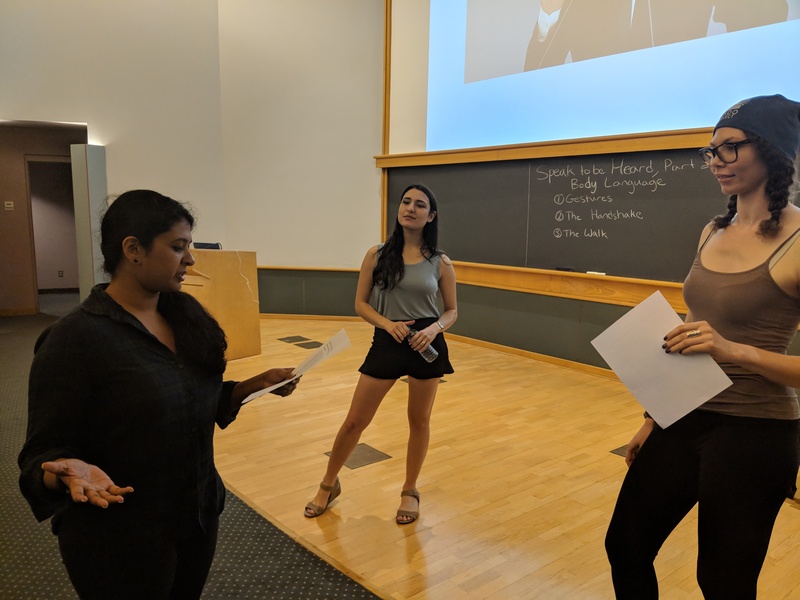 We presented monologues and scientific abstracts to practice annunciating, manipulating pitch, and utilizing the power of the pause. Judy taught us how to set the energy in the room and taught us ways to recover from feeling nervous at the podium. On the second night, Judy switched the focus to body language. After some full-body stretches, we perfected our postures and discussed different gestures and their subtle implications. We learned to avoid self-soothing habits that indicate discomfort, and to instead replace them with confident poses and precision grips to make our points come across stronger. Judy ended the night with a proper handshake and walking lesson. Judy’s “Speak to be Heard” workshop was a very unique opportunity for WiSE members to learn how to become powerful communicators. Those who attended now have the skills to better take over a room and to challenge those who try to overpower or silence our ideas. 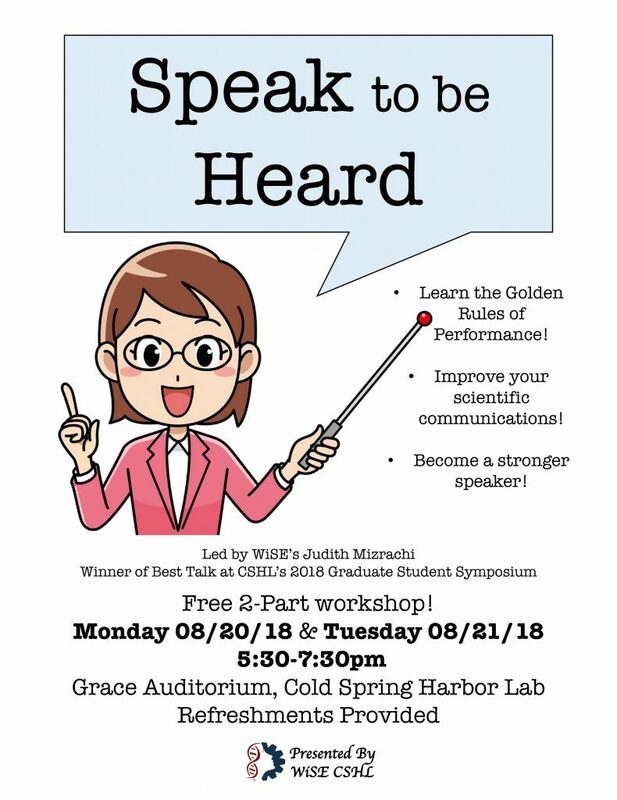 Unfortunately, this is a common occurrence during lab meetings and conferences in science, but thanks to Judy’s workshop, we have the tools to be powerful voices in the scientific community!